St. Thomas High School (also known as St. Thomas Academy) was also a parochial high school which began serving the South Memphis area in 1944 when it opened as St. Thomas Parish under the direction of the Sisters of Notre Dame of Cleveland, Ohio. The parish of St. Thomas had begun in 1905 and was named in honor of the Bishop of Nashville at that time, Thomas Sebastian Byrne. An elementary school opened in the parish in 1907, and in 1944 a high school program was added. It was coeducational for one year. Then, in 1945, the boys were sent to Catholic High School for Boys on Central Avenue at Roselle. St. Thomas High School then became an all girls school. They continued to operate St. Thomas until its closing in 1965. The south Memphis area was left once more, without the availability of Catholic parochial high school education. Since the 1940s, the Whitehaven area, south of Memphis, had been steadily increasing in Catholic population. St. Paul Parish had been erected in 1945 to accommodate this growth and had started an elementary school on its grounds in 1949. 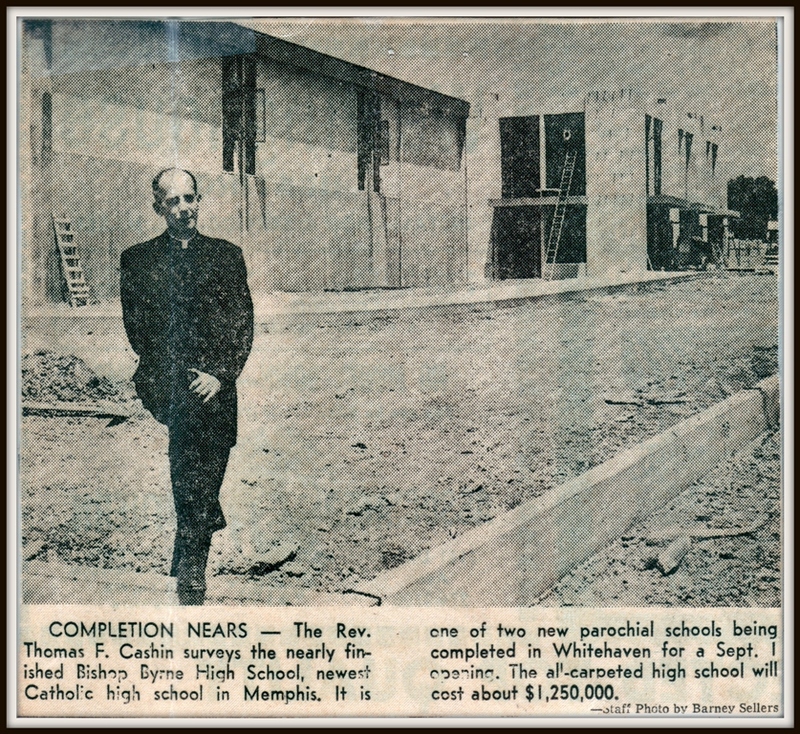 Father Edwin Cleary, pastor of St. Paul's in the 1960's, envisioned a coeducational high school in the Whitehaven area, which, up until then, left little opportunity for its Catholic students to attend Catholic secondary schools if they could not travel the distance to those schools in Memphis. The closing of St. Thomas High School in south Memphis in 1965 made those possibilities even more remote. Father Cleary, however, had put into action his dream of a Catholic High School for the Whitehaven area. Already burdened with the financial strain of building a new church for his parish, he extended his goals to include a spacious convent for teaching Sisters and a full-facility high school with a capacity of 1,000 students. Bishop William Adrian had given him permission to proceed with the project, especially in light of the promises of large donations Father Cleary was promised from a potential benefactor, the Medders Family. However, the project was well under way when the promise of those funds disappeared- along with the members of the Medders family. Later that year the Medders family was captured and arrested in Texas and charged with several counts of fraud (READ NEWSPAPER ARTICLES and READ LIFE MAGAZINE ARTICLE) , leaving the new school with a large building debt. That debt was quickly passed off to the new Diocese of Memphis beginning in 1971 and became a black eye for the Diocese that it never recovered from. The school was to to cost $1,250,000 but was closer to 2 million dollars by the time it was completed. -and the roof leaked from day one. The blue prints for the new plan erected in 1965 bear the name of St. Thomas High School. It was only prior to opening that the name was changed. The new plan was named "Bishop Byrne High School," commemorating the founder who, as administrator, scholar and builder, gave form to a vision of education that 68 years after his death continues to serve the students and families of Memphis. The new school opened in the fall of 1965 with the name Bishop Byrne High School, honoring once again the man who commissioned St. Thomas Church and its elementary school, Bishop Thomas Sebastian Byrne. He was surely one of West Tennessee's most significant persons in the history of its Catholic schools. 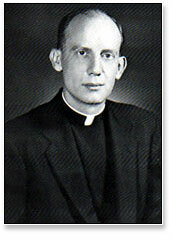 Father Thomas Cashin, a priest of the Diocese of Nashville (and a Memphian) was the first principal of Bishop Byrne. With him were the Saint Cecilia Dominican Sisters of Nashville, for whom Father Cashin had recently been the chaplain of their motherhouse in Nashville. These same Sisters staffed and administered St. Paul Grade School. Successors to Father Cashin have been Monsignor Paul Morris, Monsignor James Hitchcock, Father Joseph Umphries, Mr. Robert Strausser and Mr. Dan Wortham, the first lay co-principals of Bishop Byrne and lead administrators when the mighty class of 1978 graduated. The class of 1978 was arguably the greatest graduating class in the history of Bishop Byrne High School. Sister Jean Marie Warner, O.P. was the first woman religious principal of Bishop Byrne. (Sister Mary Philip Penney, O.P. and Sister Joan Marie Ligon, O.P. were interim principals.) Sister Jean Marie was succeeded by Mrs. Neddy R. Brookshaw in 1995, Mr. Albert Langston, Jr. in 2000 and Dr. Donald Edwards in 2003. 2010 saw the reintroduction of Clyde Israel and the new principal. "Coach" as he is more commonly referred to as came to BBHS by way of Memphis Catholic High School. Mr. Israel was a Football coach and faculty member here at BBHS in the late 70's and 80's before he moved to MCHS. The 21 faculty members include three Dominican Sisters of Saint Cecilia's in Nashville and lay teachers. The school is accredited by the Southern Association of Secondary Colleges and Schools. The 285 member student body comes from Memphis, eastern Arkansas and northern Mississippi, particularly from St. Paul School in Memphis, Sacred Heart Grade School in Walls, Mississippi and Holy Family School in Holly Springs, Mississippi. During the 1986-87 school year the Program for Academic and Educational Vocational Education (P.A.V.E.) was added for graduates of Madonna Day School located at St. James Church in Memphis. Madonna Day School is a special education school operated in the Diocese of Memphis by the Benedictine Sisters of Ferdninand, Indiana. The program allowed their graduates to continue their education in a high school setting. Between 10 and 20 students from Madonna Day School enrolled in P.A.V.E. which has since been discontinued. 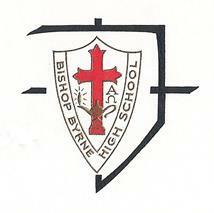 In 1990, Bishop Byrne added grades seven and eight and began the Middle School, following diocesan plans. Bishop Byrne piloted the middle school program which was added later to Memphis Catholic and Immaculate Conception High Schools. In 1993, Bishop Byrne Middle and High School became the first private secondary school to be designated as a Professional Development School for the University of Memphis. As a Professional Development School, the faculty of Bishop Byrne serve as clinical professors in the College of Education and are involved in the training of pre-service teachers. In 2013 the "powers that be" at the diocesan office in Memphis made the difficult decision to close Bishop Byrne Middle and High School at the end of the 1012-2013 school year and attempt to merge it's student population with the academically inferior Memphis Catholic Middle and High School in Midtown. As of this writing there is quite an active movement by parents, alumni and friends of Bishop Byrne to overturn this horrific decision. Stay tuned for more details.